"The Electoral College is much more advantageous for Democrats." By Louis Jacobson on Tuesday, July 17th, 2018 at 3:23 p.m. It may be more than a year and a half since the presidential election, but time and again, President Donald Trump has brought up his Electoral College victory in 2016 — even at unexpected moments, such as the joint press conference he held with Russian President Vladimir Putin in Helsinki on July 16, 2018. At one point, Trump said, "The Democrats lost an election which, frankly, they should have been able to win, because the Electoral College is much more advantageous for Democrats, as you know, than it is to Republicans." When we checked with political experts, they expressed skepticism that the Electoral College is "much more advantageous to the Democrats," particularly today. The myth of the "blue wall"
During the 2016 campaign, there was a widespread belief among the public that there was a "blue wall" of solidly Democratic states protecting Clinton. It’s human nature to assume what has happened previously will continue into the future. So after Barack Obama, a Democrat, won the 2008 and 2012 elections, some assumed that the Democrats would have a leg up in 2016 as well. To take just one example, in 2014, a column in the conservative Washington Examiner was headlined, "How the Electoral College favors Democrats and why Republicans must change it." The column argued that the Democrats start with a base of 242 electoral votes, compared with just 170 for the Republicans. Under that scenario, the Democrats would need just 28 more electoral votes to clinch the presidency; the Republicans would have a much tougher road to winning. But there’s a catch: To get to that 242 number, the column lumped in Michigan, Pennsylvania and Wisconsin — with a collective 46 electoral votes — with those Democratic base states. There was some logic to that decision, as each of the three states had voted for the Democratic nominee in the previous six presidential elections. And in the case of Michigan and Wisconsin at least, Hillary Clinton’s campaign effectively agreed, largely skipping appearances in those states as Election Day neared. But there are two problems with using this argument as support for Trump’s assertion. First, the notion that Michigan, Pennsylvania, and Wisconsin are bedrock Democratic states was shattered by Trump himself. 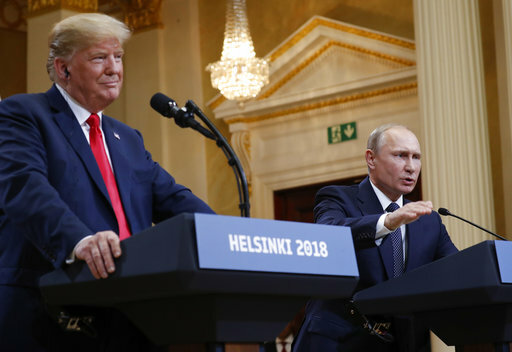 And his victory undermines his assertion in Helsinki -- in the present tense -- that the Electoral College favors Democrats. Any Democratic candidate in the future isn’t going to make the same mistake Clinton did. They will consider each of these three to be battleground states. Second, contrary to the "media narrative," professional election handicappers never considered Michigan, Pennsylvania and Wisconsin to be Democratic locks. While the Democrats had won them for six elections running, independent analysts typically considered them battleground states. The following chart summarizes the ratings that several nonpartisan handicappers gave to Michigan, Pennsylvania and Wisconsin in the 2008, 2012, and 2016 elections, where accessible online. The handicappers are the Cook Political Report, Inside Elections, Larry Sabato’s Crystal Ball, and this author (for Stateline.org in 2008, and for Governing magazine in 2012 and 2016). These analysts use first-hand reporting, past history, and polls to produce a subjective assessment of each state; they are not mathematical models based only on poll results. The ratings "lean Democratic" and "toss-up" mean that a state is considered competitive. "Likely Democratic" is not considered to be competitive, but is less safe than the most solid category, "safe Democratic." The ratings shown are for each group’s final handicapping before Election Day. In every analysis, Pennsylvania was considered a lean Democratic state — that is, the Democrats had an edge, but the contest was competitive and hardly in the bag. Wisconsin was considered a toss-up state (the most competitive category of all) or a lean Democratic state a clear majority of the time. And Michigan was considered a lean Democratic state a clear majority of the time. So while the popular perception was that, since the Democrats had won six straight elections in each of those states they were bound to win again, professional handicappers had a more nuanced view of the Democrats’ chances in those states. This caveat didn’t always get picked up in the larger discussion. In reality, a reasonable breakdown of "base" states for each party — particularly after the 2016 results have added another data point — would give Republicans at least 179 electoral votes that are pretty safe in today’s environment. They are: Alabama (9 electoral votes), Alaska (3), Arkansas (6), Georgia (16), Idaho (4), Indiana (11), Kansas (6), Kentucky (8), Louisiana (8), Mississippi (6), Missouri (10), Montana (3), Nebraska (4 of 5 electoral votes), North Dakota (3), Oklahoma (7), South Carolina (9), South Dakota (3), Tennessee (11), Texas (38), Utah (6), West Virginia (5) and Wyoming (3). For their part, the Democrats can rely pretty solidly on states worth 187 electoral votes: California (55), Connecticut (7), Delaware (3), District of Columbia (3), Hawaii (4), Illinois (20), Maryland (10), Massachusetts (11), New Jersey (14), New York (29), New Mexico (5), Oregon (7), Rhode Island (4), Vermont (3) and Washington state (12). This leaves the following states in the battleground category and assigned to neither party, with a combined 172 electoral votes: Arizona (11), Colorado (9), Florida (29), Iowa (6), Maine (4), Michigan (16), Minnesota (10), Nebraska (1 of 5 electoral votes), Nevada (6), New Hampshire (4), North Carolina (15), Ohio (18), Pennsylvania (20), Virginia (13), and Wisconsin (10). Is this breakdown subject to disagreement? Absolutely; this list has a relatively generous threshold for counting a state as a battleground. Reasonable people will disagree. But if it’s in the ballpark, then the breakdown is 187 electoral votes to start for the Democrats, 179 to start for the Republicans, and 172 up for grabs. It’s hard to call that "much more advantageous for the Democrats." Could Republicans actually be the ones who benefit? Contrary to Trump’s assertion, there’s evidence that the Republicans may actually benefit from the Electoral College system. In the five most-recent elections starting with 2000, the Republicans have twice lost the popular vote but won the presidency thanks to the Electoral College. In 2000, Democrat Al Gore defeated Republican George W. Bush by more than 547,000 votes nationally. In 2016, Clinton defeated Trump by an even larger margin — almost 2.9 million votes. Neither of the popular vote winners became president. "That certainly doesn’t suggest the Electoral College has a Democratic bias. In fact, it indicates the opposite," said Kyle Kondik, managing editor of Sabato's Crystal Ball at the University of Virginia Center for Politics. Two factors explain why today’s political environment, if anything, gives Republican states a leg up in the electoral college. First, smaller states get a disproportionately large impact in the Electoral College, because each state (plus the District of Columbia) gets a guaranteed two electoral votes before the rest of the electoral votes are allotted based on House seats (and thus, indirectly, on population). While there are some smaller blue states, the smallest states are disproportionately Republican-leaning. For instance, deep-red Wyoming gets one electoral vote for roughly 193,000 people, while deep-blue California gets one for every 719,000. An even bigger impact today may stem from the demographic makeup of the battleground states that shifted from Obama to Trump. Whites without college degrees — a key base of Trump’s support — "are overrepresented in swing states as compared to the country as a whole," Nate Silver of fivethirtyeight.com has written. "Sure, there were some exceptions, such as Virginia. But in the average swing state … whites without college degrees make up an average of 45.3 percent of the electorate, higher than their 41.6 percent share nationwide. That’s a big part of why Clinton won the popular vote while losing the Electoral College." Kondik said that as of today, "the Electoral College has a Trump lean because of his white, non-college coalition being an above-average share of the electorate in the key swing states of the Frost Belt. I say ‘Trump lean’ because that advantage might not be apparent for other Republicans with different coalitions in the future." Kondik’s point about changing coalitions making a difference brings up another issue: There doesn’t appear to be a permanent bias for either party, since electorates and demographics change over time. "I don't believe either party has had a long-lasting lean in the Electoral College," said David Wasserman, an analyst for the Cook Political Report. Published: Tuesday, July 17th, 2018 at 3:23 p.m.